This post comes to you from my bed courtesy of the lovely people at Premier Inn. Gem and I are staying in Stratford for London Fashion Week, right on Westfield Stratford City’s doorstep, which is proving rather dangerous. Nando’s, Krispy Kreme and Topshop less than two minutes away? Hide my debit card, please. Saturday’s outfit was a Cos dress, Michael Kors leather jacket, Miss Selfridge necklace and ring, Bertie boots and Zara bag. 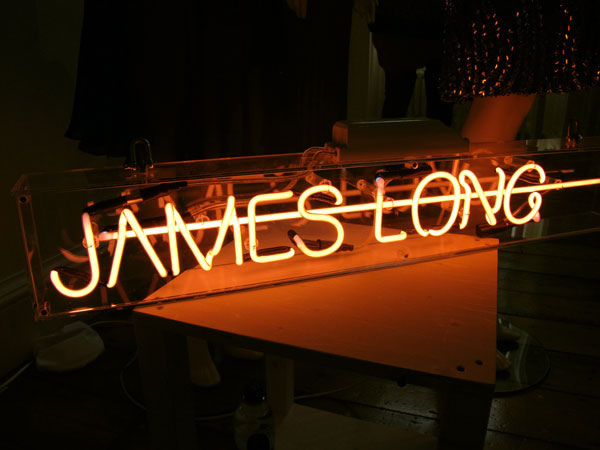 I loved this James Long neon sign. Great cocktail rings by Lola Rose. 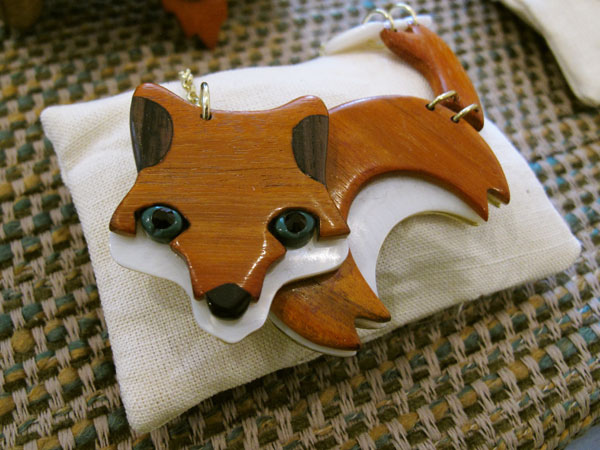 A beautifully foxy creation by Les Nereides – isn’t he adorable? 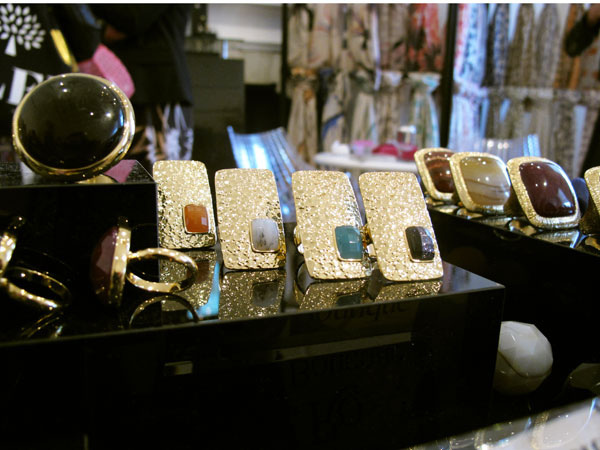 Stunning Maria Francesca Pepe jewellery in the exhibition. Front row at Felder Felder… unfortunately Kristabel and I were standing in the photography pit rather than sitting with the celebs, but we did get some excellent photos. I love those gold-heeled shoes! The highlight of Friday was the stunning ballroom show by Orla Kiely. The Portico Show Room in Somerset House was done out like a vintage tearoom, complete with frilly tablecloths, a live band and beautiful ballroom dancing. I could’ve stayed there all day. More to come in the next few days. Have you seen any of the London Fashion Week shows? Anything caught your eye? You looking amazing! You work the neon so well. I am sooooo jealous. Love Felder Felder and from what that model is wearing and those SHOES, they certainly are not disappointing! I love the colour of your dress, & it looks great with the necklace! 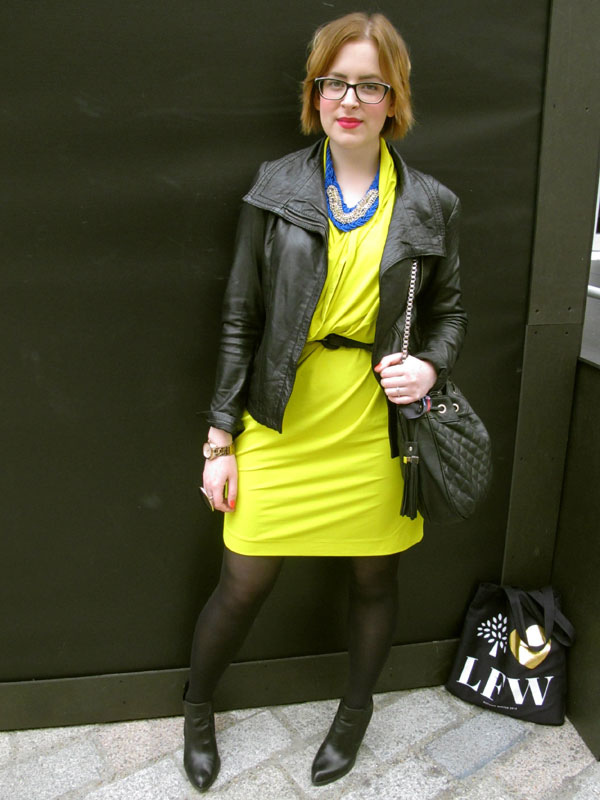 Love your outfit, the yellow dress is gorgeous and the necklace looks perfect with it! The Orla Kiely show looks amazing! Oh I wish I were at the tea-room flavored fashion show. 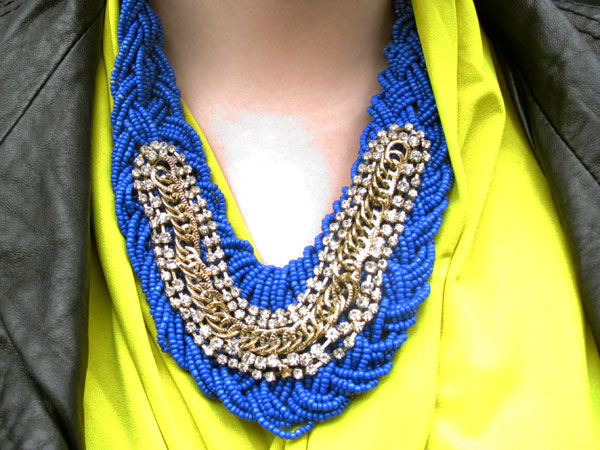 YOU look amazing in your neon dress and cobalt necklace- very fashion editor! Aw looks such fun! And you looks great too! WOW!! 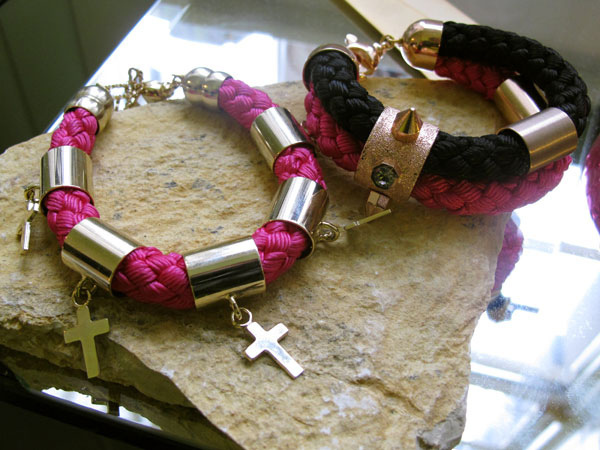 Your pics look fab, love the Lola Rose rings. I love your necklace! It goes so well with your outfit. Jen, you so pull off the neon look! 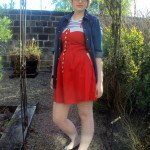 Gorgeous dress, and love it toughened up with the jacket. Sadly no LFW for me (plans didn’t work out – gutted is not the word!) but enjoyed reading posts and watching live stream. 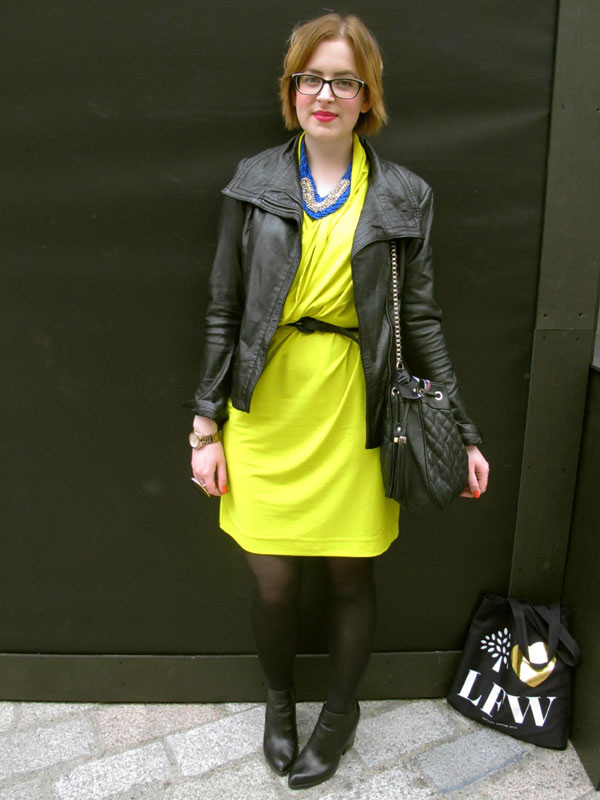 Ooh, nice mix of neon and leather! It all sounds so much fun, I wish I was invited to these things! Alas, I am only a small blogger who must be content with shots of shed door/patio. Oh my, that fox necklace is AMAZING. I still keep looking at that fox ring Damson sent you, but I unfortunately will never be able to afford it! The Orla Kiely presentation looks divine…. a great bit of escapism, which is just what Fashion Week should provide! Oh wow, the Orla Kiely show looked amazing! Love your boots too. That dress! Outfit is lovely. Hope you have a great time, looks amazing so far. Jen, you look incredible. That outfit is gorgeous. I love love love chartreuse (is that right?) with black. Love this Neon dress. Neon is my favourite thing at the moment I hope it carries through to 2013.